Becky Harris is in charge of the whisky-making process at her distillery, Catoctin Creek, in Virginia. Jim Beam, Jack Daniel and Johnnie Walker, all men’s names, have long been on bottles of whisky. But slowly, women are changing what is inside of the bottles. It used to be, and still is for the most part, that those whiskies were made by men. They run the distilleries and sell the products. Andrew Faulkner is with Distiller Magazine, part of the American Distilling Institute. He believes that about 10 or 20 years ago, the number of women holding important positions in the distilling business was pretty close to zero. With the whisky boom, that has changed. 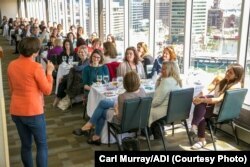 Women at a recent American Distilling Institute event in Baltimore, Maryland. Just in the Washington, D.C. area, women have key roles at three different distilleries. Two women founded Republic Restoratives. Another woman started Catoctin Creek Distilling Company with her husband. A third is an award-winning master blender at Joseph A. Magnus. Nancy Fraley is the master blender at Joseph A. Magnus. As master blender, she samples aging whisky and tests out new blends. Joseph A. Magnus just received a “double gold medal” at a whisky-tasting event in San Francisco for its straight bourbon whisky. That means the judges decided it was one of the best whiskies they tasted at the event. Nancy Fraley tastes whisky for the Joseph A. Magnus distillery in Washington, D.C.
Jos. A. Magnus also makes a “Cigar Blend” whisky. It has the taste of apricot, smoke and leather. Fraley had the idea while she was smoking a cigar one evening. 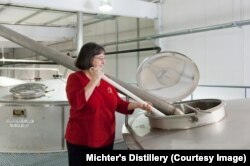 Another well-known distillery with a woman in charge of making alcohol is Michter’s in the state of Kentucky. Michter’s whiskies are some of the most expensive in the world. A version of their bourbon called “Celebration” costs over $5,000 a bottle. Pamela Heilmann took over as master distiller in late 2016. Before coming to Michter’s, Heilmann worked at the Booker Noe Distillery to produce bourbon for Jim Beam. Heilmann said she has received positive comments from bourbon fans since she earned the promotion. 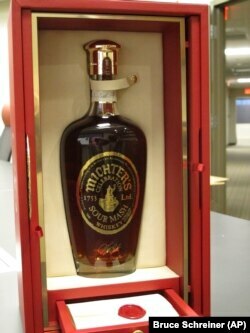 Michter's "celebration" whisky is one of the most expensive bottles made in the U.S. It costs about $5,000 per bottle. Becky Harris is in charge of the distilling process for Catoctin Creek. The distillery is in a small Virginia town outside of Washington, D.C.
She and her husband, Scott, left their jobs to start their business in 2009. 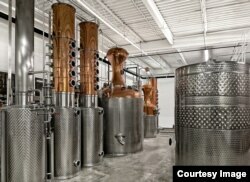 They make rye whisky and fruit brandy in an old automobile dealership on Purcellville’s main street. Unlike bourbon, which is made from a mixture of corn, rye and barley, rye whisky is made exclusively from rye grain. Harris worked as a chemical engineer before getting involved in whisky. In her past jobs, she made sure her company’s work was done efficiently and correctly. In her current job, she works to refine the whisky production process so the alcohol will taste good every time. At whisky-tasting events, sometimes she meets people who are surprised that a woman is in charge of distilling the whisky. 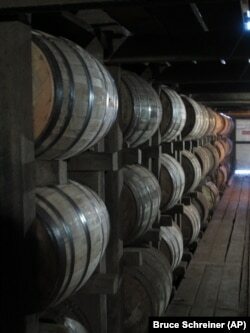 Bourbon ages in barrels at the Jim Beam distillery in Clermont, Kentucky. One of the Harris’ whiskies recently won an award too. A version of their rye whisky, aged in barrels that previously held wine, won a “double gold medal” at the same competition in San Francisco. When Becky and Scott started the distillery, they were worried she might not have a good “nose.” But it turns out, she does. In distilling, someone with a good nose has a strong sense of taste and smell. Just last year, two other women, Rachel Gardner and Pia Carusone, opened Republic Restoratives to make vodka, bourbon and rye. They recently released Rodham Rye, named in honor of former secretary of state and 2016 presidential candidate Hillary Rodham Clinton. Do women have better sense of taste and smell? Since distilling has long been a job done by men, many of the well-regarded whisky judges are men. If they give something a good review, customers will go to the store and buy it. Pamela Dalton is a researcher at the Monell Chemical Sciences Center in the city of Philadelphia. She studies the senses of taste and smell. She said some women and girls are better able to learn and classify smells and tastes than men. Pamela Heilmann became the master distiller for Michter's in late 2016. One theory on why women have better “noses” than men, Dalton said, is that women need to protect their children. The senses of taste and smell can be important when either predators or spoiled food are nearby. The research also supports the idea that as more women work in whisky production, the final product will taste better. That is because women may focus on flavors that are pleasing to both genders. The Joseph A. Magnus distillery is in Washington, D.C.
Becky Harris of Catoctin Creek says her company’s research shows both men and women enjoy her liquor. Nancy Fraley says one reason more women are getting involved in producing whisky is that more women are drinking it. Women also have more money available to spend on starting a business, and more opportunity in general, Fraley said. When the Harris’s started their business in 2009, Becky Harris does not remember meeting any other women distillers. Will you look to buy some whisky made by women now that you’ve read this story? We want to know. Write to us in the Comments Section or on our Facebook page. review – n. a report that gives someone's opinion about the quality of a book, performance, product, etc. ingredient – n. one of the things that are used to make a food, product, etc. The World’s Best Whisky Is From … Taiwan?